Like Confucious, we've eaten at Fu Fu Cafe more than once this year. The first time was actually on the same night that we ate at Confucious the first time (two lobsters with ginger and scallions, jade tofu with king mushroom, and water spinach). After Confucious we stopped in at Cafe Kubo to taste their ramen (no good). Then we went over to Fu Fu Cafe (not to be confused with Fu Fu Restaurant in the same shopping complex) for the third dinner of the night when I ordered their Pork and Chive Dumplings. 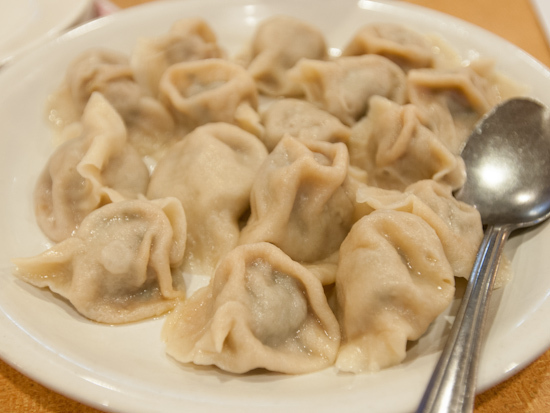 Pork Chive Dumplings ($5.99). These were as close to homemade as I've ever had in a restaurant. The value was excellent - we received sixteen dumplings for our $6. Unfortunately, five were ultra slalty, but I still ended up eating all of them (even after just having two dinners back to back). Technically, I ate 13 dumplings, and Tina ate three. 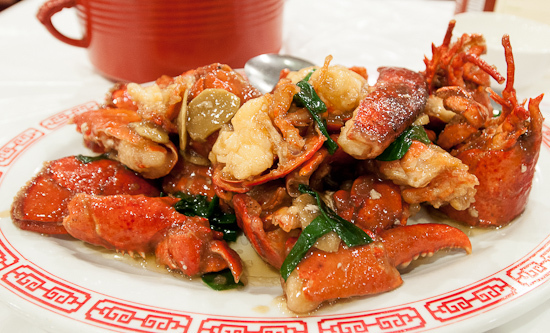 For our mid-day meal, we decided to try out Hong Kong Food Street on Bellaire Blvd. We ordered a few dishes that caught our eye (and we hoped we could finish since we couldn't take leftovers with us; we weren't heading back to the hotel for a number of hours). Congee with Pork & Preserved Egg ($5.50). We had never had congee served to us this way before. 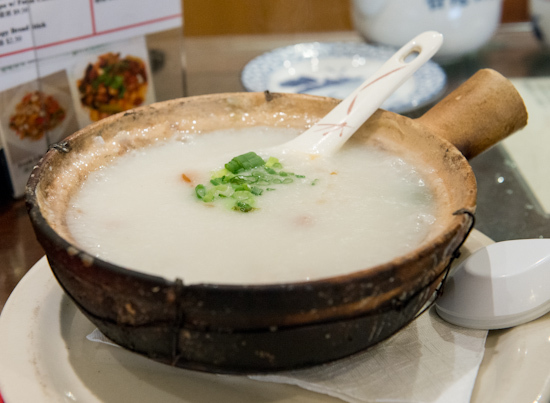 It came in a large clay pot so hot that the circumference of congee was splattering and sizzling. The texture of the rice was excellent - liquidy porridge with soft rice (not completely mushy but still in discrete pieces). I felt the pork that was in it was a bit on the fattier side and was fairly strong tasting when compared to other examples of this dish. The pidan tasted pretty good with just enough of its strong flavor to contribute positively to the congee. Tina did not like a "lardy" flavor that (to my taste was subtle but seemed to be quite strong for her) permeated the congee. She is typically the one between the two of us that enjoys congee the most, but she did not like this one because of that flavor she was overwhelmingly tasting. This year, we've had the opportunity to dine at Confucious Seafood Restaurant in Houston twice. The first time was January 2012 and the second was tonight. The highlight of both meals was the Chinese style lobsters (two of them) for $18.99.